5. Combine floral pants with a polka dot blouse, a denim jacket & a neckerchief - this combination is a bit more interesting as there is some pattern mixing going on with the floral print, polka dots and the neckerchief. I think it works since the floral pants have both blue and orange in them. Questions: Do you have "loud" pants? If so, how do you style them? Do you like any of the "loud" pants above? I do have a couple of pair of what I consider "fun" pants, Andrea!!! And I think you've shown how perfectly they can work into any wardrobe!! I think my faves are those green florals---the colors just sing to me!! Thanks, Jodie! I love the green ones, too. I think the expression,,loud pants,, is so funny. I picture them yelling!😂😂😂😂 I don't own any loud pants, I even can't remember if I ever owned one. I do like it, but on others I think! Haha, Nancy! Yes, it's a pretty funny expression. I love the J.Crew pants, but, sadly, they are sold out online. I'll have to look for them in a store. I love all of your loud pants! Yes to loud pants! Although, then I feel like I have to try and remember who's seen them as to not wear them too many times with the same people, hehe. The louder the better for me Andrea! I love all of these and think your masterclass is a great guide for the more timid who want to try these out too. Thanks, Anna! 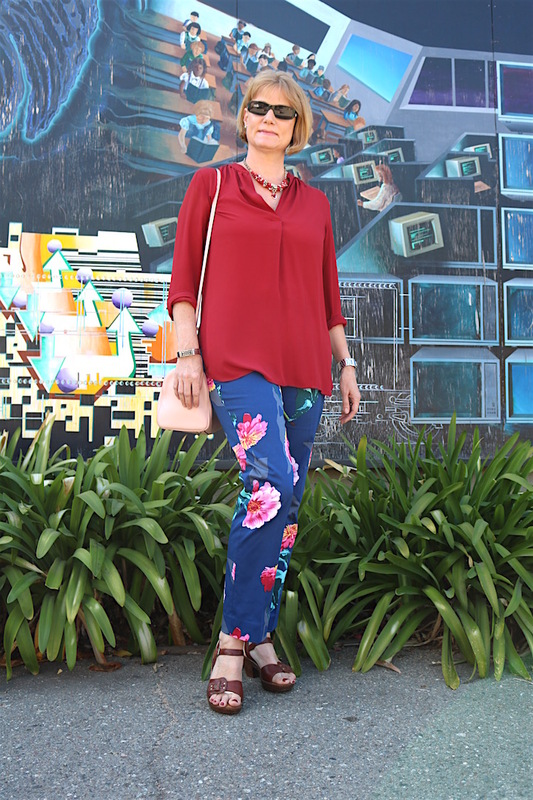 And, yes, pairing printed pants with neutrals is definitely a great way for those of us who don't wear a lot of loud clothing to be comfortable in them. But there is certainly a lot of pattern mixing that could be done... I know you could come up with some awesome combinations! I don't own any loud print pants, I just feel a bit uncomfortable in them. I love them on everyone else though! I have one pair with a small, subtle print on them that I wear when traveling, but that's about it. Your styling tips are fabulous. Thanks, Amy! We all definitely have to choose what makes us comfortable! I love printed pants! They are so fun! Love the ways you've worn yours! You have such a fun pant collection! I love how you styled all of these printed pants. I'll have to give them a try. 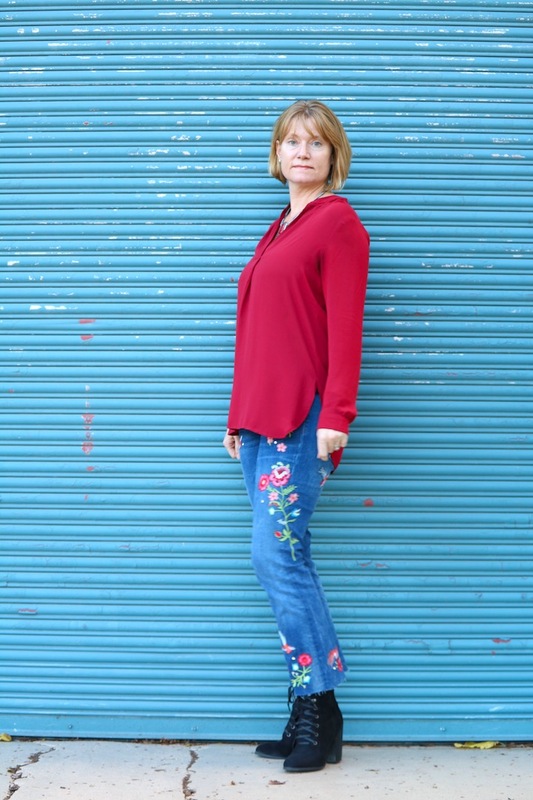 Those embroidered jeans are really lovely,Andrea! I have many trousers generously printed and generally follow the same rule:keep the top neutral! 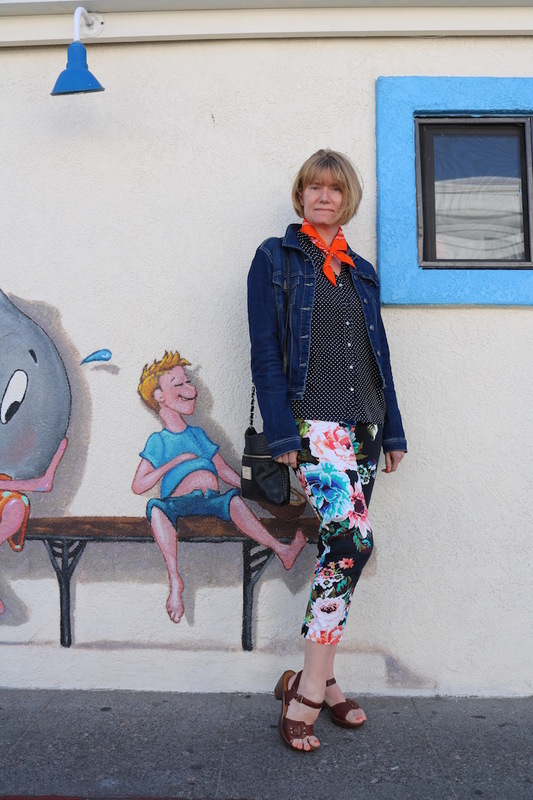 What a fun collection of printed pants! So many fun looks! Great looks! The one with the denim jacket is my favorite! 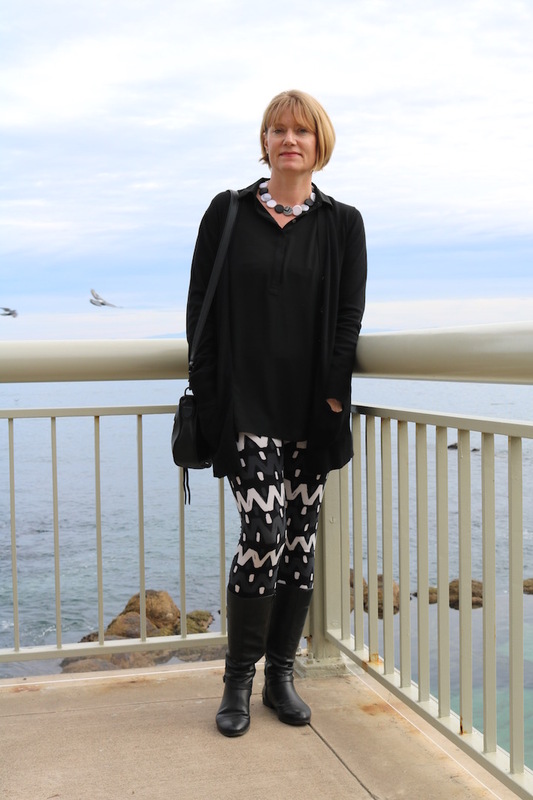 Thanks for joining our Ageless Style linkup party. I love the one with the denim jacket and pattern mixing, too! Love your classic classy style. My favourite would be the black tops with black and white patterned pants and boots. Pure class. Thanks, Alexa! I love black and white looks, too. These are all such great ideas, especially since I tend to shy away from loud pants! The last outfit with the polka dots and floral leggings is my absolute fave!!!!! Great tips! I love the floral pants with the white button up. Great spring look! Yes, I definitely have to be in the mood... I'll stop by your site soon! Would love to know which of the outfits above is your fav? I love, love, love that last one. Which might be the 'loudest' because of the bright kerchief and patterned top but I just love it. I don't know why we thought for years that pattern mixing was a no-go. I am so glad we've loosened up the rules. You look adorable. I actually love the last one, too! It was one of my first attempts at pattern mixing, and it inspired me to do more of it. Andrea, the "loud and proud" vibe is awesome! Each of your looks is great and the style tips were fabulous. Thank you for sharing your inspirations with my Fine-Whatever link up. 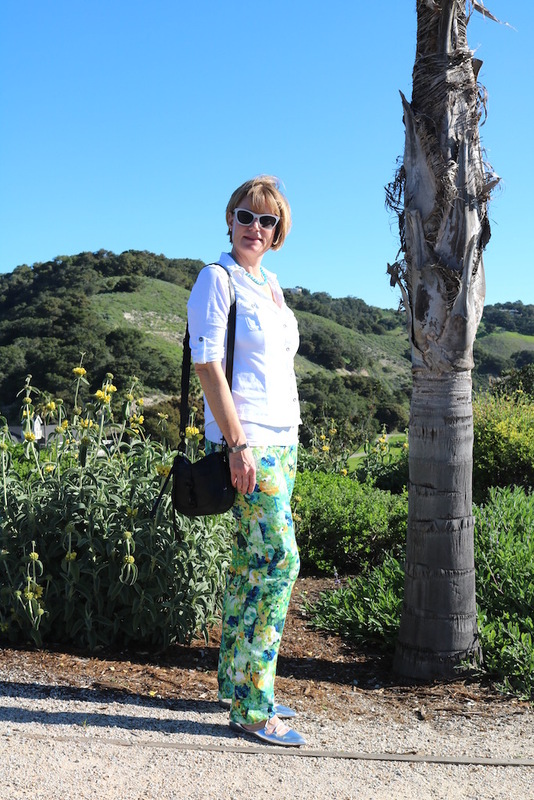 I like the look with the floral pants and a bright Tee. It's so much more fun than pairing them with the typical white, gray or black Tee. Great outfit inspirations. Thanks for linking up to Top of the World Style.